I was cutting the grass after work today and thought I saw a bird in the bushes but wasn't sure. When I got around to that part of the lawn it was gone. I came around my garden and sure enough there the little fellow was hiding in wood pile. He couldn't fly so I assume his wing was broke. We got a box with some shirts in it and I grabbed a towel and chased him around the yard before I was able to scoop him up. We boxed him and after a few phone calls ended up taking him to our Vet who said they would look at the wing but couldn't make any promises. I guess I am expecting the worse but at least we made a try. He would have been cat food if we didn't get him in a box. Kind of sad he was really pretty. Are there any wild bird rescues near you???? There is not. One that was a reasonable drive cannot accept animals because they have not had their final gov't inspection and all of the places they offer as a back up are nowhere near us. It's unfortunate to say the least. The vet basically said that they would assess the wing to see the extent of the damage and make their decision. They had also originally gave us the wildlife rescue to call so maybe they had other contacts (I hope). Good for you...you gave him a chance to live (or at least have a less painful, drawn-out death). 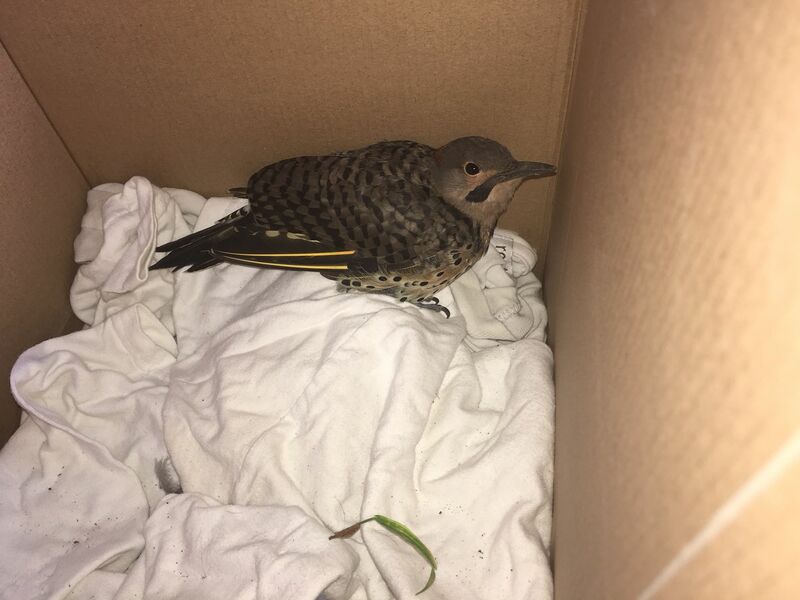 Is it an immature Northern Flicker? Poor thing. Nature can be pretty rough but it hurts to see right in your own yard. That what I thought as soon as I saw the picture. A Fledgling. He would probably be alright if he was left along and no cat got him. His parents were some place close watching, maybe. Either way, Woody you have a kind heart. Nice of you to try!